The average person spends the majority of their time at work. Often, a person finds that they are unhappy in their chosen career field. They find that getting up each morning is one of their hardest struggles; for they know that they will have to go to a place they find little satisfaction. 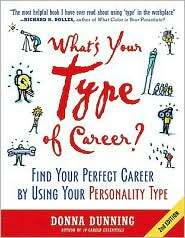 Salvation now comes in the form of Donna Dunning’s What’s Your Type of Career: Find Your Perfect Career By Using Your Personality Type. Dunning’s philosophy is based on the Jungian-based Myers-Briggs Type Indicator that features 16 different personality types. Through the easy to understand worksheets anyone can easily identify their personality type. I was truly amazed at how accurate What’s Your Type of Career: Find Your Perfect Career By Using Your Personality Type. In the past, I was required to take a course that identified my Myers-Brigg personality type. By using this book, I found that it was very accurate in determining that I was an INTJ. With the knowledge that I knew my personality type I found career choices that I never considered exploring. For anyone who feels trapped in their current job, I highly recommend What’s Your Type of Career: Find Your Perfect Career By Using Your Personality Type for it offers invaluable information that can help you find a career that you enjoy.